Well, the secret is finally out! Naturally, I'm talking about all that money which the Human Resources Minister, Jane Stewart, invested via Federal job grants. Ah, yes! You may recall that Wee Willie had to take over the duties this year when old Wiarton Willie passed away unexpectedly one year ago. 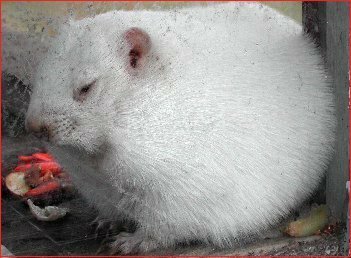 Well, there was a huge celebration on Canada Day last year (up in South Bruce Peninsula country) in memory of old Willie, who passed away at the Wiarton Willy Motel, Sunday, January 31, 1999 in his 23rd year. Good heavens! The cost of a statue in his memory was bound to deplete the coffers of the town. Groundhog Day, which was derived from the Jewish Candlemas Day tradition, observed on February 2nd, had been celebrated on that same day each year since 1956, and it was only proper for Wiarton to honour old Willie's contributions. Yup! The money went to one person, who was in charge of Wee Willie and his publicity ... which attracted some one million visitors to the Wiarton Winter Festival ... which created many jobs in the area ... which raised enough money in Provincial Taxes alone [from the sale of souvenirs and meals and entertainment] to make the premier choke on his words ... which earned enough in Federal Taxes to repay Ottawa ... and which left a surplus to take care of a dozen Wee Willies and fund next year's celebration! What a case of "sour grapes"! "Happy Frownhog Day" to you, mister premier. If Jane Stewart's Ministry does as well with the other Federal Job Grant Funding, perhaps we should invite her to run for the Premiership of Ontario.